-One in the specific test region A red band at the control (C) region should be observed. 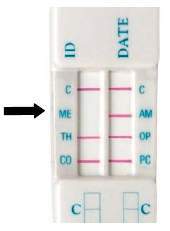 When there is no red band at the specific test region, the test is presumptive positive for that particular drug. negative result. 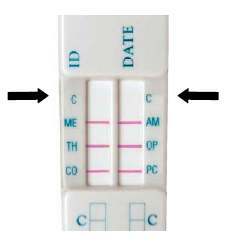 This test is positive for (ME) Methamphetamines and should be sent for confirmation testing. Call (800) 231-1584 for additional information on our drug test program.